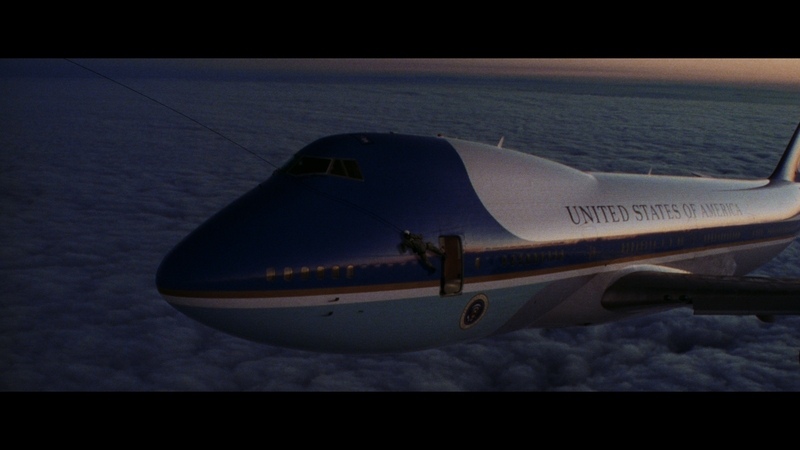 As the studio logos roll, Jerry Goldsmith’s score opens Air Force One. It’s bright and patriotic, honorable, with a high brass section and commanding drums. The work is suitable for play at military events, and as such presentable for a movie about the American President. After Nixon and Vietnam, Air Force One captures a period of political dignity. The quagmire of the first Iraq War was over. Bill Clinton wasn’t yet impeached. Air Force One comes from a place of (relative) government calm. And also, total absurdity. For purposes of entertainment, assume someone might hijack Air Force One. In this case, communist Russians. Assume too they can take control of the aircraft, knocking out multiple people in the command chain. 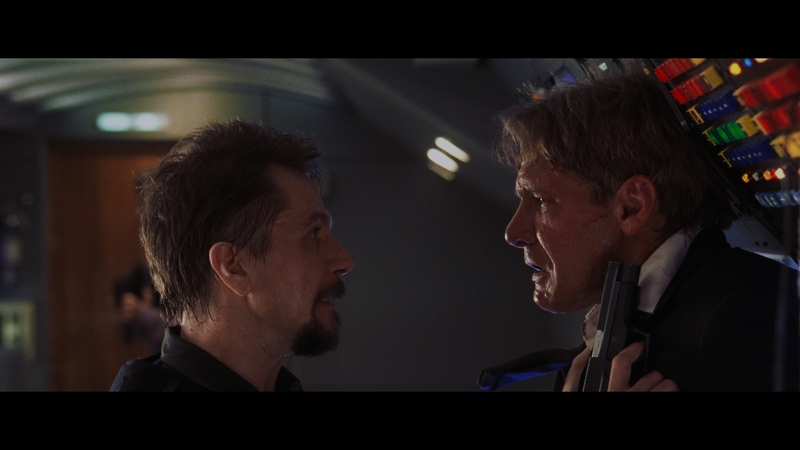 Then, Air Force One takes on absolute fantasy, a slew of jingoistic nonsense where President James Marshall (Harrison Ford) takes up an assault rifle and plows through the hijackers. The crescendo is a preposterous brawl in an open cargo hold, Marshall wrestling a terrorist on the edge. Then, Marshall becomes the pilot, Goldsmith’s theme blaring as if a proper salute. Air Force One puts the President in a place of symbolic power. Stepping away from the ludicrous action, the visual suggestiveness of Ford’s Indiana Jones-like fumbling act and unforgiving gunshots is all pro-American. It’s comical. A terrorist plot, foiled not by military intervention, but one lone (and publicly elected) gunman. That’s quaint in a pre-9/11 circumstance. When introduced, Marshall gives a speech in Russia. He goes off script, not to rabble on about his election win, but to speak from a place of empathy. Marshall’s words admit fault and promise aid to an ally. In 2018 that’s nigh unfathomable and sadly, has slipped into a place of additional fantasy. There’s a mixture of politics at work. 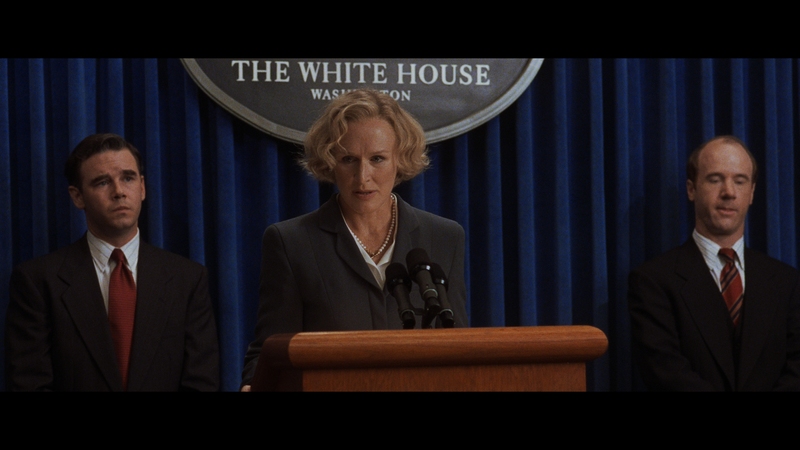 For the progressives, Glenn Close plays the Vice President and does so with no acknowledgment of her gender. She takes a hands-off approach to the events, avoiding conflict. Then there’s Marshall, President, cowboy, and Vietnam Medal of Honor winner, waving a gun around while spraying ammo at Russians. At one point, a General shouts “Nobody does this to the United States!” He’s right. As Air Force One suggests, mess with us and even our President will see to stopping you. Wolgang Petersen directs Air Force One with as much competence as this script allows. 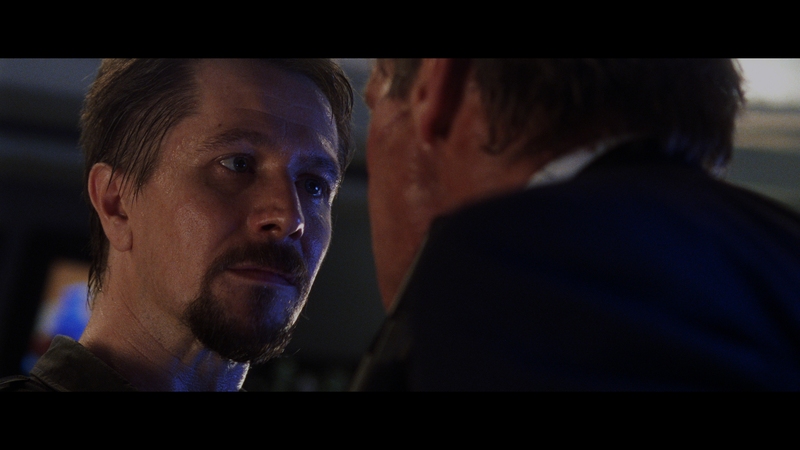 A scintillating set-up and sniveling Gary Oldman performance work even in the farcical context. As a popcorn munching blockbuster, the flag waving extremism sits behind a bevy of bullets and on-board shoot-outs. It looks fancy, certainly more authentic in production design than story. It’s too long at two hours. 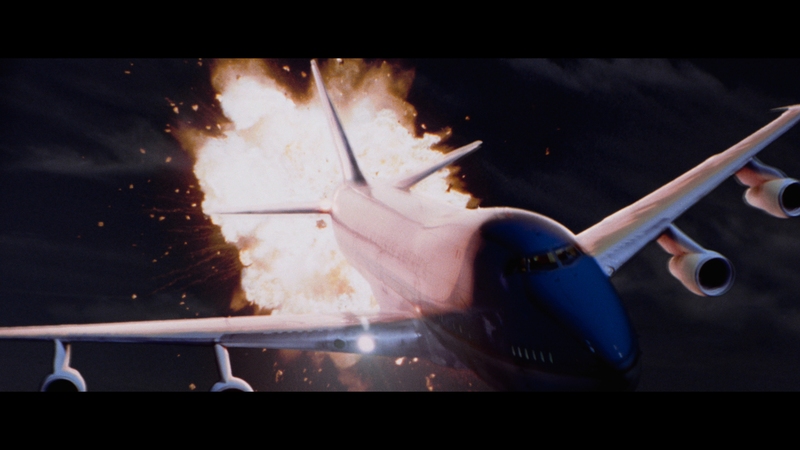 There’s little in the way of character development, but that’s not the type of movie Air Force One is. It’s pure American candy where the President wears a halo and the country is infallible. While a handful of early digital effects gunk up the images (resolution noticeably dips when they’re on screen), the rest is another Sony dazzler. Clearly scanned at 4K, beautiful sharpness creates detail where detail didn’t previously exist. Facial texture sticks out whether in close or at mid-range. Long shots of the command or press rooms keeps everyone visible, even deep into the shot. Precision grain replication makes Air Force One filmic. The encode shows no signs of interference. When terrorists unleash smoke bombs, the scene turns challenging, but still holding on without artifacts. Deep color doesn’t veer from this natural appearance. Clean flesh tones and solid primaries stand out over previous formats. Inside the plane’s nerve center, lights and dials glow with a bevy of greens, reds, and blues. It’s like Christmas, minus the festive atmosphere. Finally, a subtle HDR pass adds to the scenery. On-board lights standout, and overall brighter contrast gives Air Force One renewed depth. Black levels never fail at being perfect. Spending a good chunk of the movie inside the cargo hold, Ford is surrounded by fantastic shadows. Pure black resides wherever needed. Remixed to take advantage of Dolby Atmos, Air Force One does not appreciate subtly. Gunfire rips through the soundstage, with some of the best debris fields on this format. When someone blows out a door lock, metal fragments shatter, the lock itself clanging in a left center rear. Outside, jets fly around. Panning moves every bit of action between channels. Air Force One itself jumps between speakers flawlessly. Inside, ambiance kicks up. Engines drone on in the background with consistent application. Expect plenty of missiles and jet engines to erupt into the low-end. Tight LFE produces a great rumble. It’s well calibrated too. Extensive range highlights the action. Balance gives a small bump to gunfire and massive jolt to explosions. Wolfgang Petersen’s commentary (moderated by Michael Coleman) from the Blu-ray (and also the DVD) transfers over to the 4K presentation. That’s it in terms of extras. 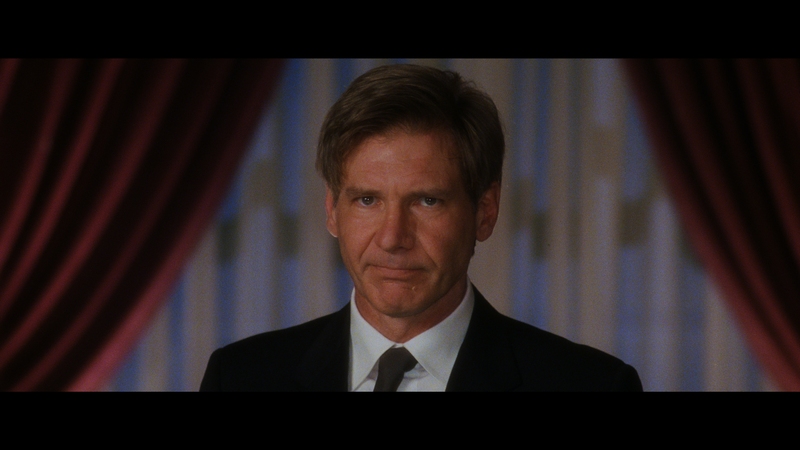 Harrison Ford stars as the perfect American President in Air Force One, a hyper-patriotic action flick that may as well drape Ford in the flag.